Click here to access the PDF complete version of this success story. would quickly be out-of-date or cumbersome to manage. 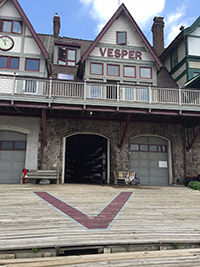 VIZpin’s VP1 bluetooth access control reader was installed on Vesper Boat Club’s main entrance door to support smartphone access control, and the organization immediately began realizing the benefits of transitioning to VIZpin’s cloud-based system. Key benefits included more secure access, additional control of their access, better data and more transparency, and easy of use for both the administrator and the users.